It’s not true, of course: This summer, like every other summer since our family moved to Vermont, we experienced at least three distinct bouts of uncomfortably hot and humid temperatures. But, you see, it’s not worth investing in central air because it’s only really hot for about one week every summer. This summer we did what we’ve done every other summer since moving to Vermont, and we headed for water. We logged numerous hours at Lake Dunmore, a mere 20 minutes from our front door. We took our annual mid-summer trip to Ogunquit, Maine, where we met extended family for a week of seaside vacation. And just this past weekend – the final weekend before the Addison County school year would effectively end summer – our family returned to the Highland Lodge, on the shores of Caspian Lake in Greensboro, Vermont. Because we make these same aqua-centric outings every summer, they serve as yardsticks for our family’s growth and development. We remember the first trip we took to Ogunquit, when I was pregnant with our first child. We recall our first summer in Vermont, when Lake Dunmore was a weekly escape. And we look back with fondness on our first visit to Caspian Lake three years ago: our first vacation after the birth of our fourth daughter. This year, all of these trips offered clear proof that my children are growing up. Road trips, for instance, no longer involve extended bouts of screaming and frantic searches for a rest stop every 30 minutes. Now that ¾ of our children are reliably potty-trained -- and with lots of help from our portable DVD player -- we can expect to pass four or five fairly pleasant hours in the minivan. Likewise, water recreation no longer involves wrestling four wiggly bodies through swimsuit-ing and sunscreen-ing, after which both parents are required at all times to hold those children in greatest danger of drowning. Now, ¾ of our children can dress and sunscreen themselves, and thanks to swimming lessons those same ¾ are reliably water-safe. This was the first summer when it was possible for me to take all four of my children to the lake unassisted. I’m not quite at the point of being able to sit on the shore reading a book, like some of the mothers I see at the beaches, but I am at the point of being able to imagine bringing a book to the beach in another year or two. However, this summer also proved that there is still one type of water recreation in which our family has a ways to go: boating. The Highland Lodge owns a nice strip of beach on Caspian Lake, including a boathouse stocked with canoes, kayaks, and paddle boats for guests to use. Our first summer at Caspian Lake we managed to overturn our canoe as we were disembarking, sending me and our two-month-old daughter, who’d been peacefully asleep in a baby wrap on my chest, spilling out into the lake. Last summer we attempted again to pack our entire family of six into a canoe. We lasted about three minutes. A friend snapped photographs to document our accomplishment, but as I never saw a single one of those photographs I can only conclude that someone was yelling in all of them. This year, my husband insisted that we take a family canoe ride during our first morning on the lake. 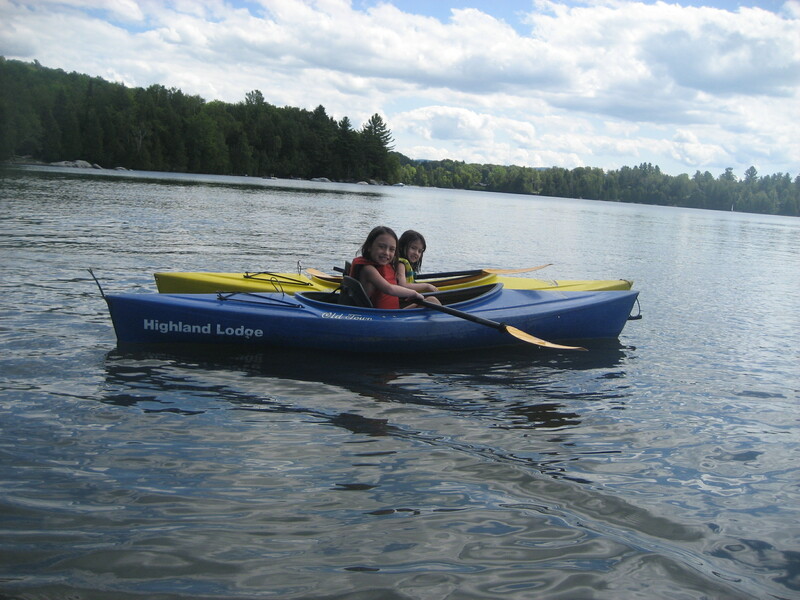 It was almost idyllic: our three oldest daughters grabbed their own paddles and “helped” enthusiastically, we were one of the only boats out on the peaceful lake, and we observed two loons fishing. I say “almost” idyllic because our two-year-old, perhaps experiencing post-traumatic stress from her first canoe ride, lay on the floor of our canoe screaming for the entire 30 minutes we were on the water. Nothing ruins a morning canoe ride like a two-year-old’s tantrum. The canoe wasn’t the only boat ride we attempted. My two oldest daughters, aged six and seven, were determined that this would be the summer when they would paddle their own kayaks. It was all they talked about on the drive to the lake. “What’s wrong?” I called back. We repeated this dialogue hundreds of times over the next two days. “I can’t turn!” my six-year-old screamed. “Well, how was it?” I asked her once we’d managed to land on shore. Ah, well, boating is a work in progress. But one thing’s for sure: Summer will come again next year. And like always, it’ll only be really hot for about one week.